Olaf Horsevik, why is your birthday not listed on the calendar???? Thank you very much, and a special thanks to Seagull, who made a creative "card"
Thank you very much Seagull! Oh, Steve, I wasn't on the ball first thing this morning. Last edited by wherrygirl; June 12th, 2011, 14:46. A very Happy Birthday to Steve and many happy returns, with numerous puzzles to solve. 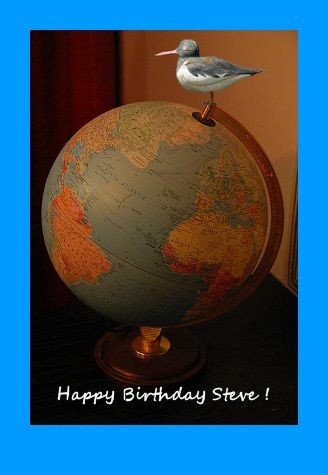 Happy Birthday, STEVE!!!! Hope you have a BRILLIANT day!!!!! Last edited by Oistein; June 12th, 2011, 22:17. I have had a very good day thank you. Made all the better by seeing all your greetings! And Ivy, I loved your little rhyme. in a vain attempt to compete with birthday-boy Steve in the latest “What place is this” puzzle!…. ….and was consequently a day late in sending this birthday card! Thank you Cecilia. And great to see that Seagull still uses the old fashion version of Google Earth!